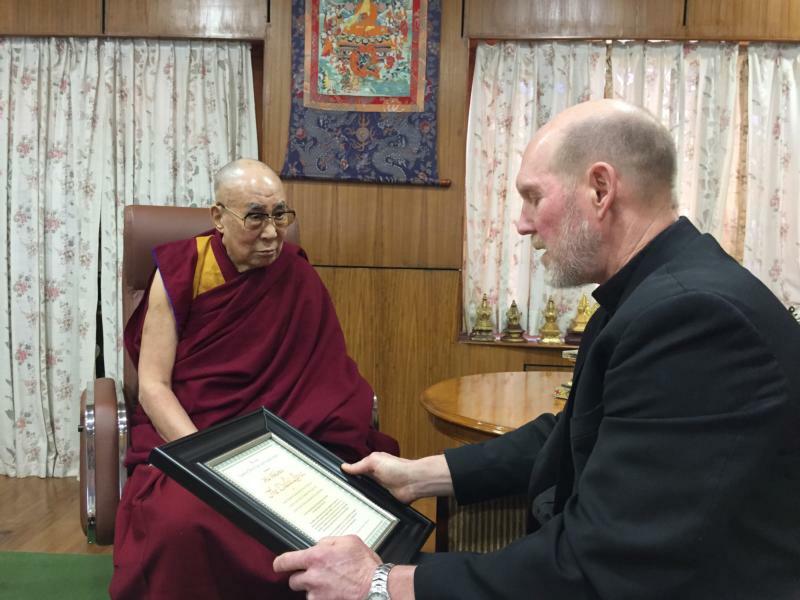 DHARAMSHALA, India (CNS) — In a Buddhist temple nestled in the foothills of the Himalayas, more than 7,200 miles from Davenport, Iowa, the Dalai Lama received the Pacem in Terris Peace and Freedom Award from Bishop Thomas R. Zinkula March 4. “I was willing to travel halfway across the world to present the Pacem in Terris Peace and Freedom Award to him because he is the Dalai Lama. He has been promoting inner peace and world peace his entire life,” said Bishop Zinkula, who heads the Diocese of Davenport. “The coalition recognizes your vision and your commitment to human rights, world peace and the nonviolent resolution of conflict. It is clear from your words and deeds that you are a person who is deeply rooted in the spirit of peace. Your leadership to promote respect for the dignity and culture of the Tibetan people fills all oppressed people with hope that peace can overcome injustice. And that’s the way he feels about the Pacem in Terris Peace and Freedom Award. He sees it as recognition of his “little contribution” to world peace. Now approaching his 84th birthday, which is in July, he told Bishop Zinkula that he has spent almost his entire life dedicated to inner peace and world peace. In his short visit with the Dalai Lama, Bishop Zinkula said he could see that the peacemaker was mentally sharp and engaged.